Maryknoll, New York – September 19, 2014 – New York City is known as one of the toughest places to live and work in the world. Yet, New York’s heritage also classifies it as one of the most compassionate metropolitan areas. The numerous Catholics raised here and those who have migrated to New York over its 400 years are the epitome of a group of residents who have made this city a special place that continues to attract people from around the world to visit, work, or live. New York Catholics – Faith, Attitude & the Works! is a new book that touches on the lives of many outstanding people who practiced their Catholic faith while contributing their talents since the founding of New Amsterdam and then the gradual rise of New York. 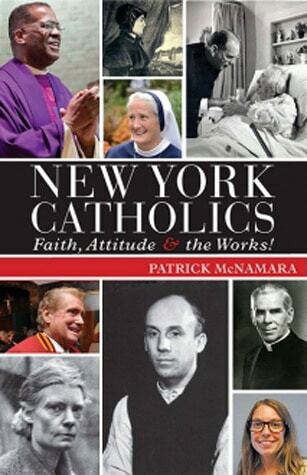 Written by Patrick McNamara, a native New Yorker and a church historian, and published by Orbis Books, the book division of the Maryknoll Fathers and Brothers, this new chronicle of a New York religious community incorporates saints, writers, thinkers and entertainers who have shaped New York’s Catholic community and helped invigorate this cosmopolitan metropolis. New York Catholics, to be published on October 1, opens with stories about the people whose faith influenced the early development of the city. The journey begins with Sir Thomas Dongan, the fifth Colonial Governor of New York, and the historical Catholic legacy continues with Saint Elizabeth Ann Bayley Seton and Venerable Pierre Toussaint. 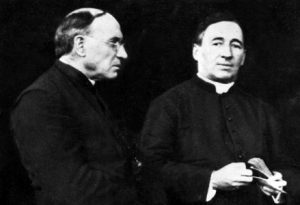 Throughout the first section of the book, readers find many more people—Saint Francis Xavier Cabrini, Father Francis Patrick Duffy, Dorothy Day, Cardinal Francis Joseph Spellman and Archbishop Fulton John Sheen— who have become familiar to and popular with the masses over generations. The section of historical voices concludes with the story of Father Mychal Judge, the Franciscan priest and hero of 9/11, whose inclusiveness and charity remain models for Catholics and non-Catholics. In the contemporary voices section of New York Catholics, we learn more about the contributions to the various dimensions of this city through the faith and work of Jesuit author Father James Martin, suspense novelist Mary Higgins Clarke and television’s Regis Philbin. Author Patrick McNamara is from Queens. He attended New York’s Catholic schools from the first grade through graduate school. After earning degrees from Fordham University and then St. John’s University, he taught in the same Catholic schools that shaped his faith. He has served as an archivist for the Diocese of Brooklyn, and his first published article appeared in that diocese’s newspaper, the Brooklyn Tablet. Mr. McNamara holds a doctorate in church history from Catholic University in Washington, DC. His dissertation was published during 2005 by Fordham University Press as A Catholic Cold War: Edmund A. Walsh, S.J., and the Politics of American Anticommunism. He coauthored Diocese of Immigrants: The Brooklyn Catholic Experience, 1853–2003 (Strasbourg: Éditions du Signe 2004) and authored The Tablet: The First Hundred Years (The Tablet Publishing Company 2008). Mr. McNamara taught history at St. Francis College in Brooklyn, and church history at St. Joseph’s Seminary (Dunwoodie) in Yonkers, New York, where he also designed and taught the school’s first course on the history of New York Catholicism. A longtime blogger for Patheos (McNamara’s Blog), he has appeared on numerous radio programs to discuss his research and writings about Catholic history. Founded during 1970, Orbis Books endeavors to publish works that enlighten the mind, nourish the spirit and challenge the conscience. Orbis seeks to explore the global dimensions of Christian faith and mission, to invite dialogue with diverse cultures and religious traditions, and to serve the cause of reconciliation and peace. Learn more at http://www.orbisbooks.com or on Facebook at http://www.facebook.com/#!/orbisbooks .